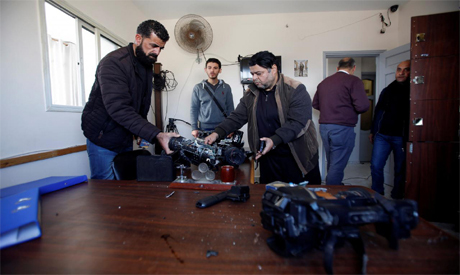 The Gaza offices of official Palestine Television station were attacked and ransacked on Friday, adding to tensions between Palestinian Authority and the Islamist Hamas movement which rules the territory. "Whoever rules in Gaza must afford protection to everyone here," Qidra told Reuters. The station broadcasts material supportive of President Mahmoud Abbas's Authority, whose power base lies in the West Bank. Station officials immediately blamed Hamas for the attack. "Hamas is deeply involved in this conspiracy," said Ahmed Assaf, chairman of the Palestininan Broadcast Corporation (PBC), speaking to the channel in the West Bank city of Ramallah. The PBC issued a statement saying the attack was a "clear reflection of the mentality of the Hamas movement and criminal gangs who believe only in their voice, and who seek to suppress freedoms". "What happened is rejected, and we condemn it," Eyad Al-Bozom said in a statement issued by the Hamas-run Interior Ministry in Gaza. He urged the station's officials to cooperate with investigators. The two rivals have failed to end the divisions since 2007.